Illuminatory Seership is a profound and truly Western magical initiatory practice, though little understood. It clears the channels of spiritual vision while gently awakening the Dragon of the West (called Kundalini in the East) to release the evolutionary power of true magical Illumination. The attainment of the full faculty of occult Seership is a simultaneous quickening of consciousness and the dissolution of the barrier in the conscious mind at the lunar level. The dissolution of the barrier allows entrance beyond it, and completely clears the corresponding internal level of vision at the same time (because there is no separation between the inner and the outer in terms of magical faculties), allowing one to see what is really there versus any previously imagined aspects. True Seership is not clairvoyance, mediumship, or “second sight” in undeveloped form. Seership is Seeing in conjunction with a concurrent state of gnosis. There is no separation between the inner and the outer; however, they will continue to be experienced as separate until the technique for circumventing the boundary is perfected. Having vivid inner vision as distinguished from those with darkened or fuzzy inner vision is not the same as having true occult Seership, and therefore does not lift the veil whether one imagines that the veil is lifted in a guided visualization (a largely ineffective technique itself the way it is normally taught) or not! Neither does the modern ‘magical’ idea that visualizing it, or acting it out in a temple setting, tell the subconscious to dissolve the barriers for you, or result in their dissolution. If it did, all those who hold that notion would actually be able to see! The inherent embryonic magical faculty is a lunar capacity. It is the projection of what is imagined as a reflective condition–whether projected into the internal subjective experience or the external objective experience–it is still just a projection that reflects our inner state, whether made consciously or unconsciously. Until that lunar level of consciousness is cleared and surpassed, experiences are not accurately perceived whether internal or external because one is not seeing past the husk or veneer of what is being experienced. The lack of occult Seership does not just affect one’s experience of ‘other’ levels of existence or reality–it affects what one thinks is reality itself. In order to be truly Hermetic, if something is true on one level it is true on all levels. So if the lack of true Seership is causing one not to see clearly as far as other levels of reality, it is doing the same in what is commonly agreed to be consensus reality. 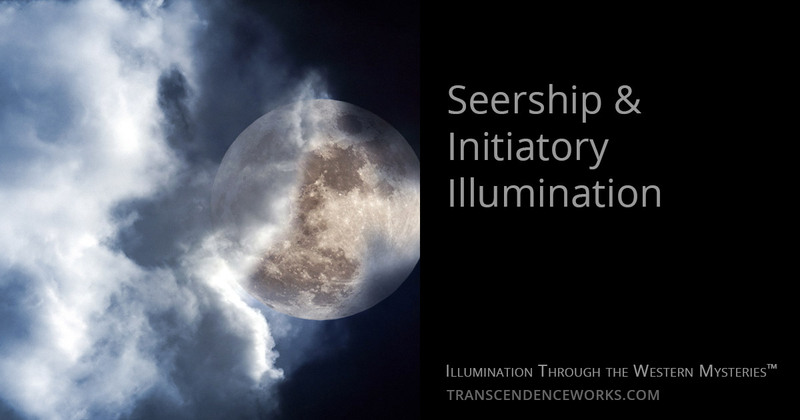 Initiatory Seership is a deeply evolutionary practice that not only opens spiritual vision but also facilitates reaching deeper stages of Illumination. As such it is one of the most practical paths within the Western Mysteries, though also one of the least understood. As part of the Open Seership Project™, learn more about FREE instruction in Initiatory Seership. I want to see the Moon with a single eye. I want to find the Sun where there is no sky.